Who Wrote the Book on It? Are you ready to find someone you can trust to take your QuickBooks bookkeeping worries off of your shoulders and just get it all done for you? Would you like to learn how to save money and do your own books, quickly and easily? 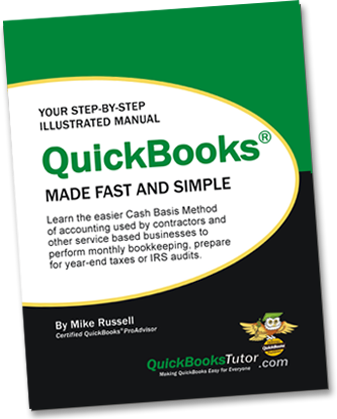 In either case, you’re in expert hands with “the guy who wrote the book on QuickBooks:” Mike Russell Bookkeeping and Tax Services and his team of credentialed QuickBooks Professional Advisors. We know bookkeeping can be a pain, so much so that it’s easy to procrastinate getting your QuickBooks books caught up. But when tax time comes and your CPA is saying they can’t get your return done until your QuickBooks file is cleaned up, we’re great at taking that headache off your hands. First, his firm offers customized QB accounting systems set up for your specific industry, monthly bookkeeping, CFO services, QuickBooks cleanup, and tax preparation to small businesses in the Austin area and remotely to businesses all over the U.S.
And second, he offers QuickBooks classes and books for business owners who want to do it themselves. Want to find out more? Take a look at our QuickBooks bookkeeping and tax services, our QuickBooks classes, or our QuickBooks Made Fast and Simple book to see which solution will meet your bookkeeping needs. Or give us a call and we’ll design a QuickBooks solution that’s right for your business needs. Call for your complimentary, no-obligation consultation now! 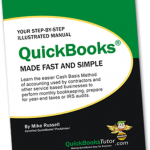 Have you purchased "Quickbooks Made Fast and Simple"?